Depending on your perspective, Massachusetts home buyers continued to purchase homes in July despite, or because of, rising mortgage interest rates. Mortgage interest rates began to rise in May and currently are about 1 percent higher than three months ago. 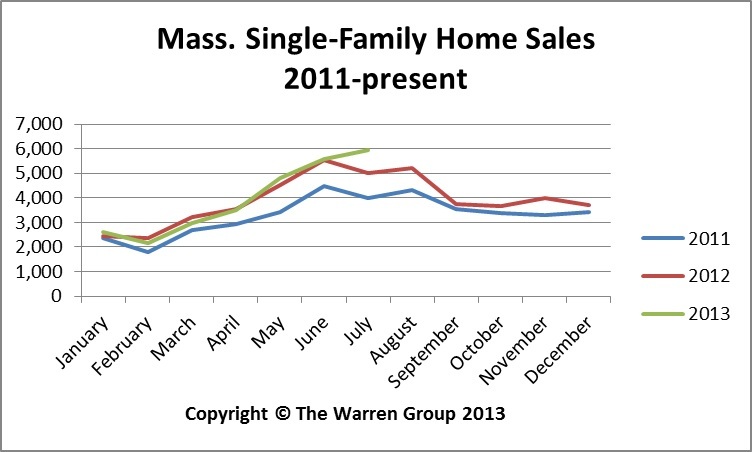 Sales of Massachusetts single-family homes increased 18 percent in July compared to July 2012. Single-family home sales were the highest for any month since June 2006, The Warren Group, publisher of Banker & Tradesman, reported August 29, 2013. A total of 5,941 single-family homes sold in July in Massachusetts, an increase from 5,014 homes sold during the same month in 2012. July 2013 was the best month for single-family home sales since June 2006, when there were 6,152 sales. Last month also was the best July since 2005 when 6,672 single-family homes were sold. Through July 2013, 27,600 homes have sold in Massachusetts, up 3.5 percent from 26,647 single-family homes sold during the same period in 2012. The median price of a single-family home rose 10 percent in July, increasing to $349,000 from $317,275 in July 2012. July marked the 10th consecutive month of median price increases, and the fourth consecutive month that the median price of a single-family home exceeded $300,000. The median price for homes sold January through July was $320,550, up more than 12 percent from $286,000 during the same seven months in 2012. Condominium sales also jumped in July, rising nearly 17 percent from a year earlier. A total of 2,336 condos sold in July, up from 1,998 condo sales in July 2012. Through July, condo sales were also up almost 5 percent, increasing to 11,094 sales from 10,607 sales during the same seven-month period last year. The median condo price increased 5.5 percent in July. The median selling price was $310,000, up from $293,730 in July 2012. Through the first seven months of 2013, the median price of condos in the Bay State increased about 3.6 percent.